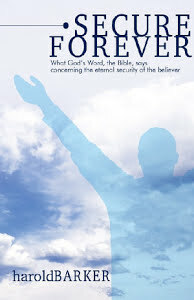 Since the first publication in 1974, Secure Forever has been widely acclaimed by Christian ministries and Bible colleges because of its clear presentation of the subject of eternal security. In this inspiring newly revised edition, Harold Barker examines the word of God with scholarly care and simplicity. Using the strong evidence of scripture as his foundation, he skillfully explains why it is impossible for the believer to lose his salvation. The fact that the believer is secure forever is supported throughout the book by insights from great Bible teachers such as Latham Chafer, Ironside, Wuest, Rice, Newell, Dehann, Straus and others. One of the many strengths of this book is its in-depth discussion of misunderstood passages. Reading this book will help anyone clearly see that salvation is the perfect and complete work of the grace of God, apart from any human effort. God’s infinite keeping power is certain because it is based solely on the finished work of Jesus Christ. Yes, for the believer in Christ, salvation is once, for all–and forever!